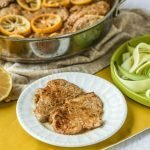 Easy Lemon Butter Pork Tenderloin - a low carb skillet dinner! 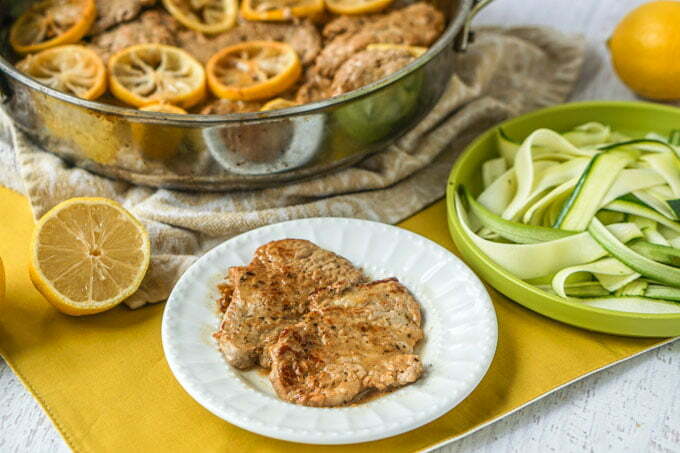 This easy lemon butter pork tenderloin recipe is very easy to make and full of flavor. 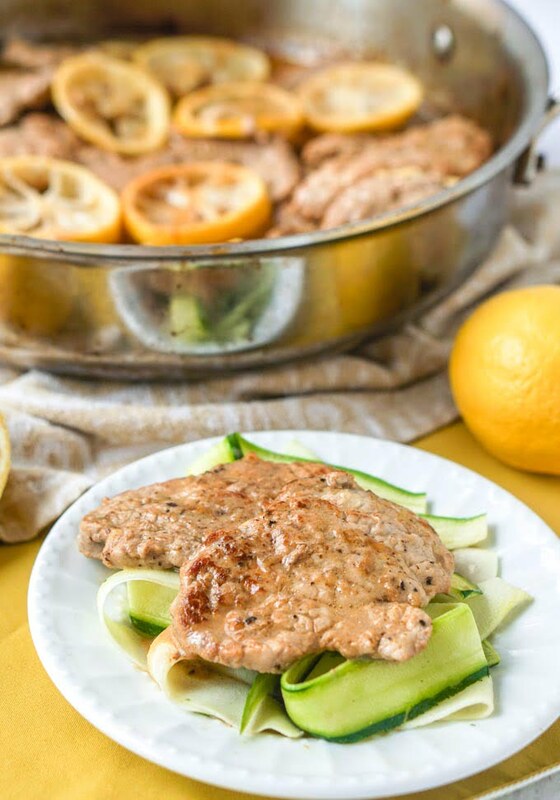 The meat is so tender and the lemon butter sauce is bright and tangy. Each serving has only 1.3g net carbs! You might also like this stuffed pork tenderloin with mushroom sauce recipe. I personally love the flavor of lemon in both savory and sweet dishes. I grew up with a few yummy Middle Eastern dishes that use mainly lemon and perhaps that is why. 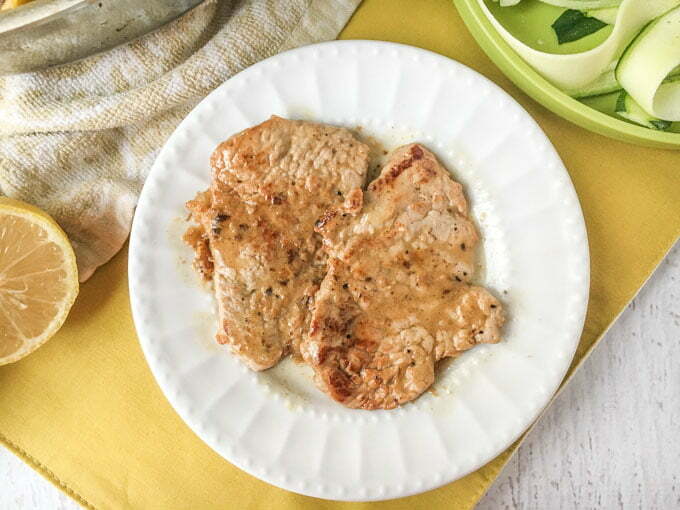 Actually this easy lemon butter pork tenderloin dish tastes a bit like bamya which is a lemony okra stew. It’s super easy to make and the lemon butter sauce is out of this world! I like to take a pork tenderloin, cut it up and pound it into medallions. They cook much faster and it seems like you are getting my meat this way. All you need to do is cut it up into 1/2 inch pieces. Take each piece and place in a baggie and pound thin with a meat mallet like this or a heavy skillet. The mallet is much easier though. So once you make the pork medallions, sprinkle some salt and pepper on them. Then add a bit of oil to a large skillet and brown them on both sides. Once they are browned, I set them aside to make the sauce. I used the lemon juice to get up all the tasty baked on bits. Once you scrap up the bits, add in the butter and garlic. Whisk it all well to combine. Now you can add the pork back into the pan and lay the lemon slices on top. Cover and cook for 5 more minutes. At this point if the pork is done, take it out and put it on platter. Get out the cream and add it to the sauce. Whisk it well and pour over the pork. If you like cooked lemons you can add them on top as they are edible but not many people like to eat them. 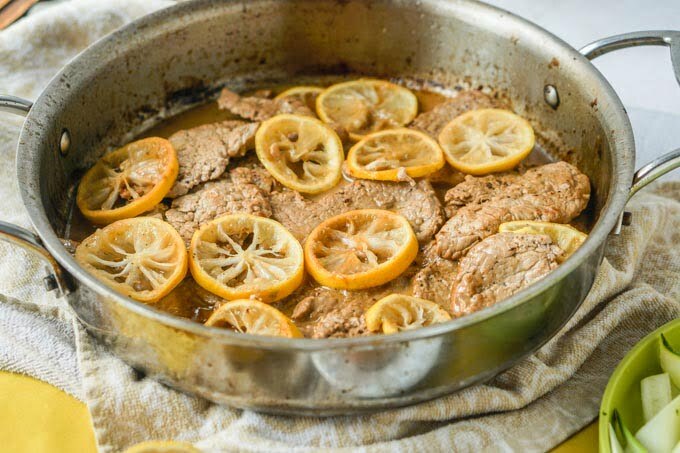 This skillet dinner of easy lemon butter pork tenderloin is very easy to make and full of flavor. The meat is so tender and the lemon butter sauce is bright and tangy. Each serving has only 1.3g net carbs! To make the pork tenderloin medallions, cut the roast up into 1/2 inch pieces. Place each piece into a baggie and using a meat mallet or heavy skillet, pound it thin. Sprinkle salt and pepper on all the thin cutlets. Heat the oil in a large saute pan. Add the pork and brown on both sides. Take out the pork and use the pan for the sauce. Add the lemon juice and try to scrape up all the brown bits. Add in the butter and garlic and whisk to combine. Place the pork back in the pan and lay the lemon slices on top. Cover and cook for 5 minutes or until the pork is cooked. 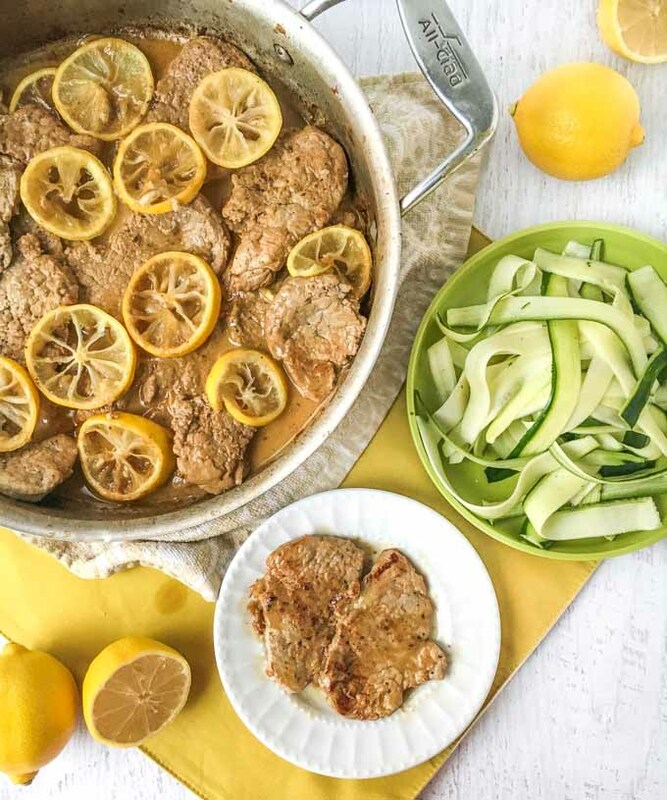 Take out the pork and lemons and add place on a platter. Add heavy cream to the sauce and whisk to combine. Pour over pork and serve. 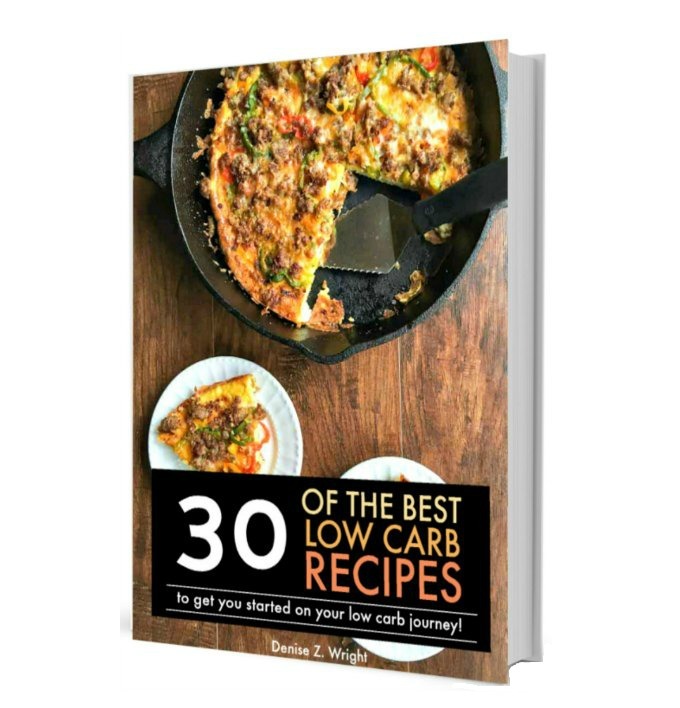 Previous Post: « Low Carb Holiday Menu Ideas – dishes everyone will like!